Lives of those visiting and working at the Sector 26 Grain Market here are still at risk. Pressure of the powerful trader lobby and administrative apathy has increased the risk. The all-powerful trader lobby to blame? 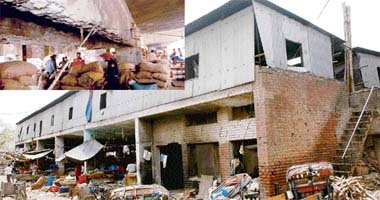 Sunday’s incident of a roof collapse at the Sector 26 Grain Market has brought to fore the role of the politically powerful trader lobby in encouraging encroachments, tampering with infrastructure and protecting offenders. Commission agent Naresh, who survived the June 10 Grain Market tragedy by a whisker, has saved his life but lost his legs. In fact, for the philanthropist, who donated fruits to the PGI gurdwara, life came a full circle as the premier medical institute saved his life today during an operation. The Chandigarh administration has decided to form a 'core group' of senior officials of different departments to handle an exigency like the collapse of a shed in the Grain Market, Sector 26, which resulted in two deaths on Sunday. 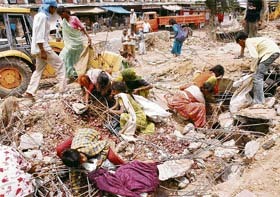 From amid the ruins of the ravaged structure in the Sector 26 Grain Market, life is once again limping back to normalcy. The poise, the spirit and the energy shone through as Shiamak Davar’s Institute for Performing Arts and the Durga Das Foundation came together for the annual “Summer Funk-2007” at Inderdhanush Auditorium, Sector 5, here today. The evening was filled with energetic grooves, animated moves and an eager bunch of around 500 participants, from tiny tots to adults, who weaved their magic onstage. Pollution caused from e-waste and used batteries can pose a major health threat if not checked in time, this was stated by experts at the concluding day of the two-day training programme on management of hazardous and electronic waste and used batteries. Hundreds of electricity consumers in the city are a peeved lot these days over receiving inflated bills for March to May. The added total is in variation with individual addition of the charges under different heads, including energy, fixed, electricity duty, meter rentals and service equipment. Even as roads in Sector 38 West have been in deplorable condition for the past couple of years, the authorities concerned are yet to wake up to the inconvenience being caused by these to residents. 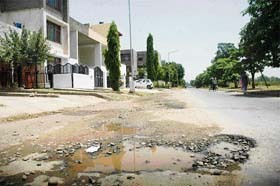 One of the roads in Sector 38, Chandigarh, that has not been re-laid for the past many years. Complaints of muddy water being supplied in Phase II were received here today. Residents said the problem started yesterday and since then they had not been able to use water for their daily chores. Chairman of the Anti-Terrorist Front Maninderjit Singh Bitta has held Capt Amarinder Singh responsible for the Dera Sacha Sauda row. The allegation has been made by Bitta in a letter written to Prime Minister Manmohan Singh on June 10. Taking a strong note of senior BJP leaders leaving the party and joining the Congress a few days ago, Sahib Singh Verma, organisational in-charge of the BJP, Chandigarh and Punjab, today asked workers to start a membership drive. The president of the local Municipal Council, Rajinder Singh Rana, has been issued a show-cause notice by the principal secretary, local government, on the charges of misusing his powers. Jagbans Singh, an IA&AS officer of the 1986 batch, has taken over as accountant general (audit), Haryana, with effect from June 6. A day after Chandigarh Tribune highlighted the alleged raw deal given by the Mohali police to Harbhajan Singh Punia, a Sector 71 resident, two human rights organisations today moved the Punjab State Human Rights Commission in this regard. Members of the newly constituted body of the Mohali Press Club were honoured by the All-India Punjabi Journalist Association at a function at a Sector 35 hotel. Addressing the gathering, association president Shingara Singh Bhullar called for unity among the fraternity. The crime branch of the Chandigarh police claims to have solved several cases of snatching in the city with the arrest of a Kharar resident. The police has recovered a knife and a stolen Honda Activa scooter from the accused. A cyclist was crushed to death under a CTU bus near the railway line in Mani Majra on Saturday night. The police said the victim had been identified as 48-year-old Muzahidin, a resident of Bapu Dham Colony in Sector 26. Two shops were burgled in Sector 22 C last night. The police said Prem Kumar of shop Nos. 44 and 45 lodged a complaint with the police alleging that thieves burgled the two shops after gaining access through ventilators. The soaring mercury has sent the prices of bottled water sky-rocketting. As the demand for bottled water has increased in the recent years, the manufacturers, too, have hiked their prices. The Central Scientific Instruments Organisation has developed critical components for use in nuclear power generation plants. This would reduce the country’s dependence on foreign supplies or other ad hoc low quality measures adopted in the past. Identifying, sorting and packaging different qualities of apples from same lot would no longer be done by the human eye and hand. A machine has been developed which would take the burden off the workers and grade and pack fruit at the touch of a button. Members of the Indian National Students Organisation have asked Panjab University vice-chancellor to reconsider his decision to enforce “No Vehicle Day” on the university campus on all Mondays. 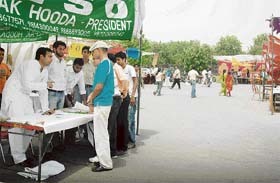 State INSO president Vikas Rathee said the organisation would oppose any forceful implementation of the policy. The assistance camps for students set up by various student organisations at Panjab University have put a question mark on the very existence of the university’s enquiry counter. People from this relatively new state have made the city their second home. These are the people from the hilly state of Uttarakhand. The people of Uttarakhand, who began migrating to Chandigarh nearly four decades ago, have blended perfectly with the people, culture and ethos of the city. Members of the Uttarakhand community perform a Kumaoni dance during one of their cultural celebrations in Chandigarh. 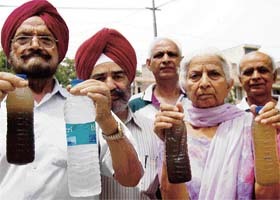 Faculty members of Government Medical College and Hospital, Chandigarh, who were keeping their fingers crossed for the past two months after the Punjab government decided to enhance the retirement age of teachers in medical colleges, have now started losing hope of getting any benefit out of it. In an effort to honour voluntary blood donors, the Blood Bank Society, Chandigarh, will hold free movie shows on June 14, which is World Blood Donors Day. As the managements of Piccadilly and Neelam cinemas have offered free shows of the films 'Pirates of the Caribbean' (Hindi) and 'Shootout at Lokhandwala', respectively, the UT administration has given exemption of entertainment tax for this purpose. 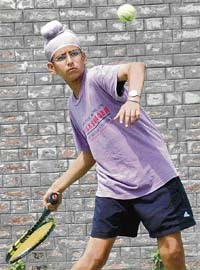 Ranjeet Singh, a trainee of the CLTA Army Children Scheme shocked top favourite Samar Adhikari of Maharashtra in straight sets 6-3, 6-2 during the AITA Talent Series Tennis Tournament. A superb knock of 83 runs by ERCA’s skipper Vaibhav Kaushik and a fine opening stand of 86 runs scored by MES openers resulted in the opening match of the u-12 Edmund Rice Challenge Trophy Cricket Tournament being declared a ‘tie’. The combined boys’ and girls’ team of Chandigarh had an edge over the West Bengal team 20-5 in the pool C encounter, on the opening day of the u-17 Eighth Sub-Junior National Korfball Championship, held at the Panjab University campus, here today.